With every edge tool there comes a time when the constant use against an abrasive material such as clay will dull the edge and it is time to resharpen. I have found over the years that the latest development in diamond stone technology has helped tremendously in keeping a keen edge to steels, rakes and wires. With the help of various shapes and grades you can maintain an edge that will surpass any other sharpening method. The particular diamond stone product that I use is by DMT and I have had several types that have been developed over the years, from the Diamond Whetstone to the DuoSharp bench stones, all made in the USA. The DuoSharp bench stone on the left is 10" x 4" x 3/8" or 250.0mm x 100.0mm x 9.5mm in size. This dual purpose diamond stone has extra coarse on one side and coarse on the other. This is easily recognizable by the color coding used on each side of the sharpening stone. With this size diamond stone it is easy to maintain all of my steels that I use. Black. Extra coarse grit for removal of large amounts of material on damaged tools. Blue. Coarse grit for restoring an edge on tools that have been left unsharpened for some considerable time, or in the case of steels where they get dropped and the edge gets bent to some degree. Red. Fine grit for replenishing that razor sharp edge to its former glory. Green. Extra fine grit, this is used to finally polish an edge that has been trued by a coarser grit. Ideal for finishing touches to your rakes and finishers. 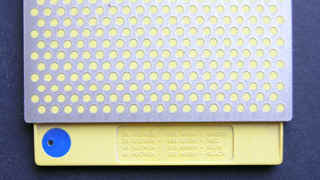 The above two photographs show the color coding on the end of each diamond plate, as you can see the close up of both sides show the blue, for coarse and the black, for extra coarse. The beauty of this type of identification is the small dot of color in the large dot. This shows the coarseness of grit on the reverse side without turning the stone over. The diamonds are embedded in nickel on a precision ground plate ensuring a lifetime of service. 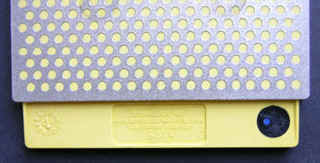 The trademark pattern of the interrupted surface on the diamond plate acts as a swarf catching pocket to allow maximum performance while sharpening. The only lubricant needed if any is water and this is only to remove the metal shavings. When sharpening your steel you will find that the surface will clog more than normal because of the clay that gets caught on the surface. This is easily removed with a scrub brush and water bringing the diamond stone back to its original state. The DuoSharp comes with a non skid mat but to enhance this product the additional Duobase will hold the diamond stone securely and also allow knuckle room while sharpening. The base will hold firm with the rubberized feet underneath. To secure the diamond stone there are a couple of grips that index onto the Duobase by way of the rectangular slots in each end of the base. These slots are set so as to accommodate both the ten inch diamond stone and the eight inch. The plan photograph to the left shows the pair of diamond stone grips in the ten inch position, the open slots on the inside are for an eight inch size diamond stone. You will also find with this Duobase that there is a handle provided underneath. This proves to be handy when deburring of steels is required. Once the steel has been sharpened and then needs to be deburred to obtain a razor edge, just lay the steel on the modeling table and dress the edge with the diamond stone using the handle provided for easy control. The beauty of this is, your less likely to take a sliver out of your finger if just dressing by holding the diamond stone itself. 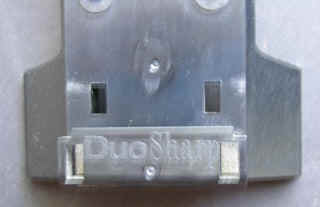 The DuoSharp slips under one of the grips and the other is pushed firmly down until it clicks into place. This provided a solid non slip fixing. As you can see from this angle shot the grips are flush with the top of the diamond plate making it easy to dress the steels by holding the handle underneath. I have the coarse grit on show indicated by the blue dot. 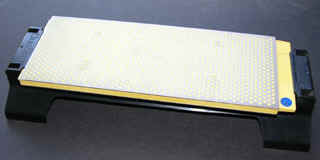 In Diamond Stones (pt2) I will cover DMT Whetstones another fine product for sharpening your steels.